Solo, source to sea traverse, photo and film expedition, documenting landscapes and current timeline of the Orange River of Southern Africa by Rob Wilson. The source in the Drakensberg Mountains at an altitude above 9500 feet was the setting for the start of a 2400km + journey to the chilly Atlantic ocean. The first 40km´s were hiked along the river bank due tovery little water. 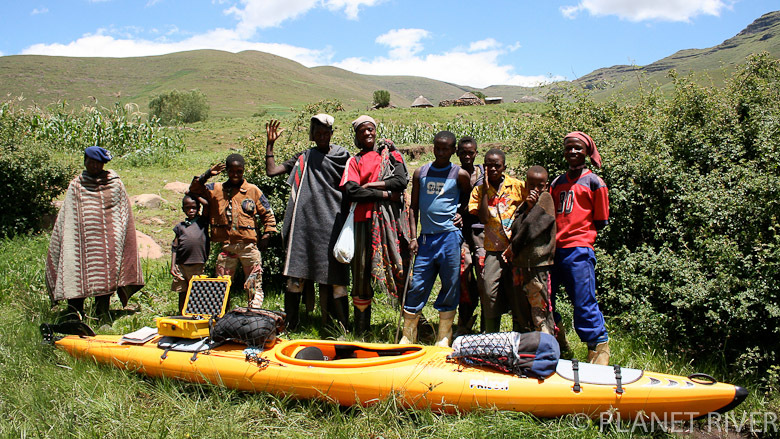 The rural landscape of Lesotho with little infrastructure and peaceful people was a calming influence for the first weeks on the water, even with the low water levels. The Orange River watershed drains approx. 77% of Southern Africa´s land area and combined with the expected annual highveld thunderstorms, water levels went up soon after departing Lesotho, making distance and progress a realistic formality. But, by the time on reaching Upington, the only city on the banks of the Orange River, progress was delayed to water levels reaching 900+ cumecs. The most technical sections of the river lie for a few hundred kilometers below which includes the river near Kakamas and Keimoes reaching across to 4.5 km in width and the Augrabies Falls and its 18km, class 5+ gorge. Joined by Ine Skjørten (2 weeks) and Brett Pomario (1 week) at Blouputs, was a welcome addition to solo life. A good time to talk and express.